Everything that we do is about evangelization. What is evangelization? It is the proclamation of the good news of Jesus to the world. Therefore, as CFC-FFL, our call and our thrust is evangelization. The word “evangelization” sums up who we are and what we are called to do. 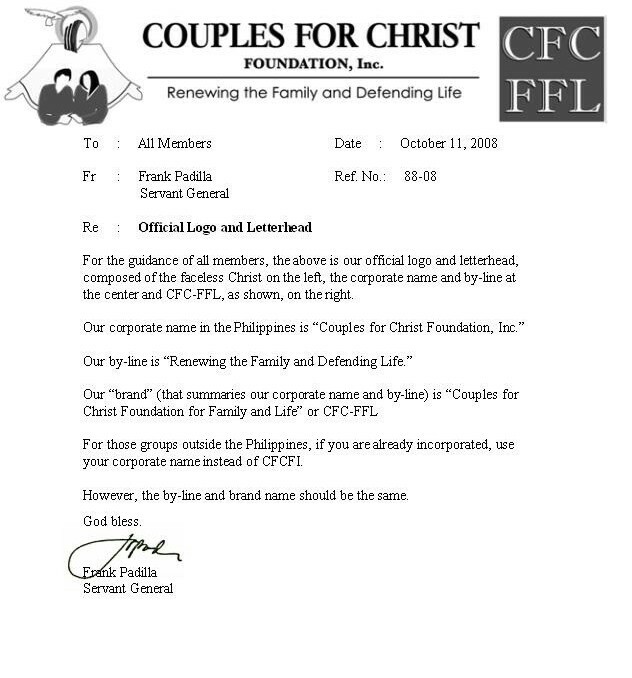 CFC-FFL is an evangelistic community, and all CFC-FFL members are to become evangelizers. How does this happen? First we evangelize by the witness of our lives, both personal and community. This is walking the talk. Second, we evangelize by the witness of our mouths, through our programs and ministries. This is talking the walk. We seek to evangelize, not to recruit. We seek to save souls, not to chalk up numbers. But since evangelization is a continuing process, which does not stop even after someone has accepted Jesus as Savior and Lord, then we desire to bring in those we are evangelizing into a support environment that can help move them on to holiness of life and to service to Christ. These environments are the parishes, religious groups, ecclesial communities, and of course CFC-FFL. For us, since CFC-FFL, together with our involvement in our parishes, can provide the means by which we can become a holy people of God, it is natural for us to seek to bring people into CFC-FFL. As such, evangelizing them can continue in a deliberate and structured manner. This is where the aspect of “recruitment” comes in. There are the formal programs such as the Life in the Spirit seminars and the CFC-FFL Christian Life Seminar (CLS). But since evangelization is proclaiming the good news of Jesus, then evangelization is also the many other works that people do in the name of Christ. For us, these are works such as building communities among the poor, our pro-life advocacy, and our service in our parishes. Ultimately, however, we look to the CLS as our primary means of starting the work of evangelization, because the CLS is the entry point to the fullness of community life and support. In doing whatever we are doing, being centered on Christ and consequently speaking about Christ is a must. This is what makes a work evangelization. Otherwise, it would just be a good work, if we simply did good but did not witness to the Person who causes us to do good works. If our good work does not ultimately introduce a person to Christ, then it is still laudable good work (which Christians should do), but it is not evangelization. Every CFC-FFL member is to be an evangelizer, in the ordinary day-to-day circumstances of his life (with relatives, friends, neighbors, co-workers, co-students). Every CFC-FFL member should be open to doing mission, which is to evangelize outside of one’s parish, province or country. Evangelization starts with one’s self, then radiates to the other members of the family. In turn, the family and the home become the base for evangelistic work that we do in the larger society. Evangelization is nurtured in community, where the tools to growing in the Christian life are offered, where the call to holiness is seriously looked to, where the opportunity to serve others is provided, where brethren support each other to enter more deeply into the life of Christ. Community also brings together the varied spiritual gifts of members, together with human resources, to be able to do a more massive and effective work of evangelization in the larger society and in the world. The very mission of Jesus is to bring good news to the poor (Lk 4:18). This has both spiritual and social dimensions. Our evangelization then takes us into the realm of work with the poor, of having a preferential option for the poor, of building the Church of the Poor. Evangelizers follow in the footsteps of the Savior and Master, who is the One who sends us forth to the ends of the earth. We are the slaves of Jesus. Many of us will be called to leadership, and many will be used in the power of the Holy Spirit. But there is only one Master, and our work of evangelization necessitates servant leadership. This is according to the teaching of Jesus, where the leader is the servant, where the greatest is the least of all. Finally, our evangelization brings us to serving the Church, through our parishes and dioceses. We are an integral part of the Roman Catholic Church. We do the very mission of Jesus, and the Church is the body of Christ on earth. We live out our call as a lay ecclesial community that is integrated in the life and mission of the Church. We make ourselves available for service in the parishes, especially in the areas of family and life. We are an evangelistic and missionary community committed to become families empowered by the Holy Spirit to renew the face of the earth. We strive for holiness of life, as we commit to renew the temporal order through our work with the poor, our work for justice, and our work for life. We are a servant of the Church, working to renew her children through every generation and throughout the world, until the Lord returns once again. We affirm our call to evangelization as our primary thrust, in accordance with Jesus’ commission in Mark 16:15 and Matthew 28:19. What is evangelization? It is proclaiming the good news of salvation in Jesus. This work is to be done throughout the whole world. This in turn is the missionary dimension of our call. Evangelization is through and by the family. The family is both the object and the subject of evangelization. The condition of families will determine the condition of societies and of the whole world. Strong families are also the base on which our work will proceed. As John Paul II says: “The future of humanity passes by way of the family.” Thus we affirm the priority of our evangelistic work, which is marriage and family life. 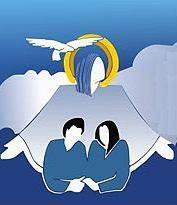 Evangelization and family come together in our Family Ministries. Our Family Ministries provide us a womb-to-tomb family renewal process, and the way for our work to be passed on through the generations, until the Lord returns once again. In line with this, we must necessarily be concerned about the ever-growing pervasive culture of death, which seeks to totally destroy marriage and the family. Thus our thrust is also for life. We are strongly and proactively pro-life. We will promote the culture of life. This is done through our Pro-Life Ministry. Now the culture of life can only thrive in a societal environment that is more and more reflective of the kingdom of God in our midst. As such, we will also strive to do our share in renewing the temporal order, aside from our spiritual work. This is concretized in our Social Ministries, our work of building the Church of the Poor. Here we will not necessarily get involved in all social concerns, but will choose our battles, where the Lord leads us. Currently, these are in three areas: our work of building integrated communities among the poor, our prison ministry, and our work with migrants. Other aspects of the social dimension—such as health, education, livelihood, the environment—will be support programs. Thus, we are an evangelistic and missionary community. Everything we do is about evangelization, as it is about Jesus Christ the Savior, and about this good news that we proclaim to the world. Our evangelization in turn is composed of three major thrusts—the Family Ministries, the Social Ministries, and the Pro-Life Ministry. In all these, the Lord can only work to the full extent of the power of the Holy Spirit if we are holy instruments. And so we look to the call to holiness and strive to walk the way of Jesus, which is the way of the cross. Finally, we are an integral part of the Holy Roman Catholic Church. We exist to serve the Church. The CFC Foundation for Family & Life is a gathering of concerned CFC brethren looking to the restoration, preservation and strengthening of the authentic Couples for Christ charism, focused on evangelization and family life renewal. We indeed have been guilty of infidelities to our covenant, even as God continued to use us in the power of His Spirit in our first 25 years. But in His love for us, God brought us to Lamentations this year, as His way of opening our minds to the dangers of continuing to slip away from our call. Now there is conflict and disunity. But even this is part of God’s plan to purify us. “Lead us back to you, O Lord, that we may be restored: give us anew such days as we had of old.” (Lam 5:21). The key to restoration is to go back to our original charism. Going back is the way to go forward.